Backstage at the BBC’s studios in Elstree, Sam Smith is wandering around in a silk kimono and ruby red stilettos. Don’t worry, he’s not gone full Mariah. It’s all in aid of a sketch for his TV special, Sam Smith at the BBC, which airs on Thursday. In real life, the singer tries his best to remain humble. “I don’t ask for puppies in my dressing room,” he laughs. “But sometimes – and I’m really embarrassed about this – when they’re doing my make-up before I go onstage, people do up my laces for me. Still, there was a time after the phenomenal success of Smith’s debut album, In The Lonely Hour, when his head was turned by fame. He was hanging out with Beyonce and Justin Timberlake at Taylor Swift’s 25th birthday party, and jetting off to Mexico for the world premiere of Spectre, the Bond film for which he wrote the Oscar-winning theme. “I did get a bit… I wouldn’t say big-headed, but I was living in that scene way too much, and I needed to be brought back down to earth,” he says bashfully. “There was one time when I wore a new pair of pants every day and threw all the old ones away. I got obsessed with wearing different pants every night. Smith, it has to be said, is not the sad, fragile young man he’s often portrayed to be. Yes, his emotions run close to the surface, but he’s also funny, forthright and supremely ambitious. “I want to play Wembley Stadium one day,” he declares, the suggestion being it’s inevitable, not some distant dream. We speak on the day his second album, The Thrill Of It All, is released. Smith has just come back from a signing at HMV in Oxford Street, where he wasn’t mobbed so much as sobbed. Smith’s second album has a lot to live up to. Its predecessor was the fastest-selling debut by a British male solo artist in US chart history; making the 25-year-old a four-time Grammy winner, with four UK number one singles and an Oscar to boot. In interviews, he’s described the new album as “dangerous” – a description that seems at odds with its accessible, soul-searching ballads. So what did he mean? He’s wrong, of course. The album went silver in the space of three days, and it’s comfortably winning the race to be this week’s number one – on both sides of the Atlantic. “The reception has been incredible. I’m just so shocked,” the star says. Settling down in his record company’s boardroom, surrounded by his own gold discs, Smith delved into the album’s key tracks, revealing some of the secrets behind his latest love songs. The album’s first track is also its first single; a gospel-inspired ballad in which Smith pushes his lover away to avoid getting his heart broken. Sam says: “The relationship this song is about was kind of tumultuous. It ended a few times… but by the last time, I knew I’d be OK because I had a plan in place. “That’s what the song is saying: Every time you’re hurting me, I’m crying less. I know I’m going to be OK because I’ve become too good at this now. I’ve done it before. Sam tells the story of a boy in Mississippi coming out to his father. It was partly inspired by criticism that Smith didn’t use gender-specific pronouns like “he” and “him” on his first album. Sam says: “I had an amazing coming out experience and I forgot, maybe, how tough it is for some people. “But after the first album I realised I have a responsibility as a gay pop artist. It’s important for me to be a voice and hopefully inspire some young children that are living in the outskirts and have no way in. Backed by Amy Winehouse’s old band, The Dap Kings, Sam sings about heading out on the town to shake his ex “out of my system”. Sam says: “That’s about the day I got dumped. I was sitting with my best friend and my sisters in the garden on the day it happened. He dumped me over the phone and I remember walking back into the house and saying, ‘It’s over’. One of the best vocal performances on the album, the title track is a simple piano-and-strings ballad that finds Smith musing on the perils of fame. Sam says: “I was in a relationship when I released In The Lonely Hour and I posted pictures of us on Instagram. I very quickly learned a lesson: I don’t want to be famous in that way. I just felt embarrassed. “When the relationship ended, I was like, ‘Wow, I really messed that up by putting pressure on it when I shouldn’t have’. The whole of In The Lonely Hour was about a married man who Smith had an unrequited crush on. He’s left that far behind – but not before writing one final tribute. Sam says: “Towards the end of the writing process, he started to slip back into my mind. But the song wasn’t about longing for him – I was just remembering my relationships and summing up the similarities between him and the guy who this record’s about. “I think when you sing about love, you’re singing about every love you’ve ever had. Not just always about one person. Sam Smith’s album is out now. 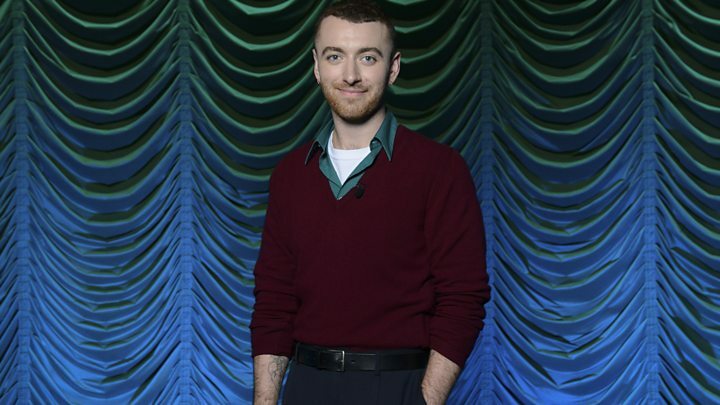 His TV special, Sam Smith at the BBC, will be broadcast on Thursday at 20:00 GMT on BBC One.